No added sugars, contains naturally-occurring sugars. Protein Blend (MILK Protein Isolate, WHEY* Protein Isolate, MILK Protein Concentrate, Calcium CASEINATE*, Emulsifier: SOY Lecithin), MILK Chocolate Flavour Coating (18%) (Sweeteners: Isomalt, Sucralose; Non-Hydrogenated Palm and Palm Kernel Oil, WHEY* Powder, Fat-Reduced Cocoa Powder, WHEAT Flour [GLUTEN], Emulsifiers: SOY Lecithin, E476; Flavouring), Humectant (Glycerol), Sweeteners (Sorbitol, Erythritol, Sucralose), Fructooligosaccharides, Isomaltooligosaccharides, Sunflower Oil, Flavourings, White Chocolate Flavour Drizzle (1%) (Sweeteners: Isomalt, Sucralose; Non-Hydrogenated Palm and Palm Kernel Oil, WHEY* Powder, WHEAT Flour [GLUTEN], Emulsifier: SOY Lecithin; Flavouring), Fat-Reduced Cocoa Powder, Sodium Chloride, Natural Orange Flavour, Antioxidant (Tocopherol-Rich Extract) *From MILK. 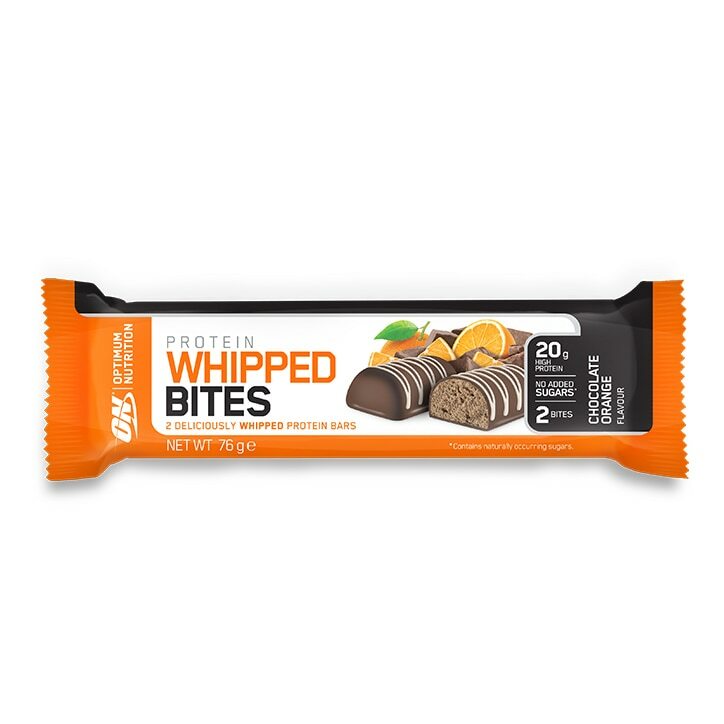 Optimum Nutrition Whipped Bites Chocolate Orange is rated 4.0 out of 5 by 2.